Find out how you can start investing for a child or grandchild's future. This guide is not personalised advice. This guide is not personalised advice. Please remember tax rules can change and the value of the tax benefits will depend on your circumstances. The value of investments can fall as well as rise so you could get back less than you invest. 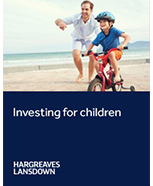 This handy guide gives a straightforward, easy-to-follow summary revealing how you can put money aside for a child and help them to secure a nest egg for their future. This guide is not personalised advice. Please remember tax rules can change and the value of the tax benefits will depend on individual circumstances. The value of investments can fall as well as rise so you could get back less than you invest.